It’s amazing how a pressure washer can make your housework a lot easier. If you want to score the best heavy duty pressure washer today, then continue reading! People buy a heavy-duty pressure washer simply because they need a cleaner that has more cleaning power than a medium-duty machine. Heavy duty pressure washers are usually gas powered but electric heavy-duty models are now available on the market. If you intend to use the machine too often and in really tough cleaning tasks such as cleaning huge driveways and ATVs, then choose a unit with 3000 PSI or higher. With the right attachment and pressure adjustment, heavy-duty pressure washer units are also safe to use on cars and outdoor furniture without damaging them. In The Quick Comparison Table Below! The PowerBoss 3300 Max PSI Pressure Washer is one of the most coveted heavy-duty pressure washers on the market recently. It has a PSI level of 3300 PSI and a GPM level of 2.5, which amounts to a cleaning power of 8,250 CUs. If you take a closer look at the unit, you’ll notice that it has a steel frame and a pair of pneumatic wheels. These two features are a must in heavy-duty cleaning. The pneumatic wheels give better maneuverability while the steel welded frame allows you easy carriage of the unit, as well as helps protect it from impact during operation. 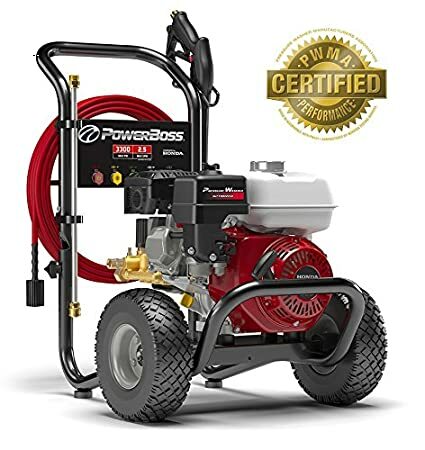 Whether you want to do medium-duty tasks like cleaning your patio, house siding, and even car wash or do heavy duty tasks like cleaning high sidings, heavy equipment, and factory floors— the PowerBoss 3300 PSI pressure washer is a great investment. Looking for a heavy duty commercial pressure washer for industrial cleaning jobs? PowerBoss 3300 PSI is a unit worth trying. This high-pressure machine is powered by Honda GX200, which is a 196cc OHV engine. This engine is specifically engineered to tackle tough cleaning operations, thus there is no too tough job to handle with this unit. The triplex pump with an adjustable pressure regulator is what makes this heavy duty petrol pressure washer one of a kind. This allows you to control the PSI level of the pressure washer to match the specific task at hand. Muscle fatigue and back pain are not an issue when using this pressure washer. Well, this unit has made sure to incorporate a handle with an ergonomic design so that you don’t have to bend too low when using the machine. Using this unit on steep and uneven terrains won’t even become a problem, thanks to its 10-inches pneumatic tires that provide great traction. Protected with a steel frame that is welded properly, you can tell that this heavy duty high pressure washer is here to stay for a long time. To make your pressure washing experience even better, this unit comes with a heavy duty pressure washer hose. The EASYflex hose is 30 ft long and can be used in outdoor tasks. Aside from the 5 quick-connect nozzle tips included in the package, the nozzles actually provide a pre-defined spray pattern each. Therefore, you have all the 5 basic spray patterns needed for whatever cleaning operations you have in mind. You know you get your money’s worth as this amazing unit is PWMA certified. PWMA stands for Pressure Washer Manufacturers’ Association. Because of the steel welded frame, this unit is quite heavy and bulky. You only have 3-month warranty service for commercial uses. This is a one-pull start machine, so novice users who are looking for an electric start unit won’t be happy with this one. 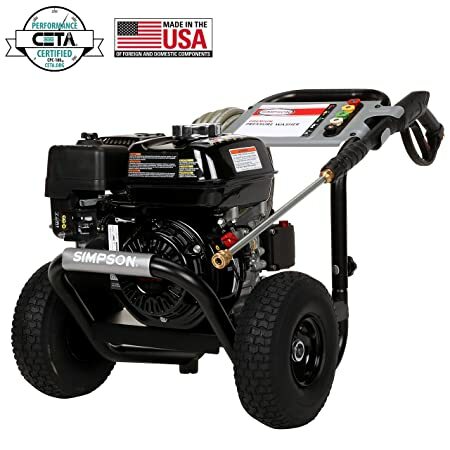 The primary selling point of most Briggs & Stratton Unit is their reliable and powerful pressure washer gas engine. This particular heavy duty pressure washer boasts a PSI level of 3300 PSI and a maximum flow rate of 2.5 GPM. With a total cleaning power of 8,250 CUs, you can complete various cleaning tasks, may it be for medium duty or heavy duty cleaning. On various heavy duty pressure washer reviews, Briggs & Stratton Elite 3300 PSI unit has garnered mix feedback from the users. Most of the positive comments are directed at how efficient the unit is in handling tough cleaning jobs like sports courts and large driveways. But to be fair, some users say the unit’s design could have been better if it allows more attachments. If you don’t need a lot of attachments, such as the heavy duty pressure washer gun and surface cleaner, then you won’t have much problem using this unit. But if you do, then I suggest you stick with attachments from Briggs & Stratton brand to ensure they are compatible with the machine. 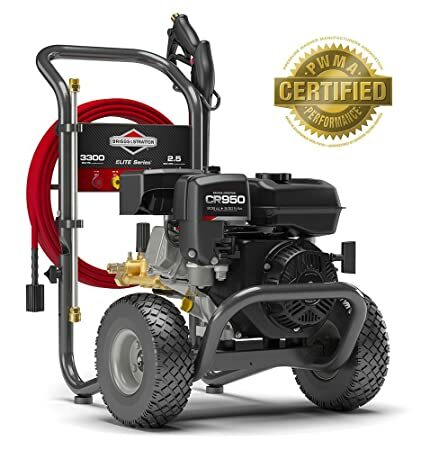 Briggs & Stratton Elite 3300 PSI pressure washer is equipped with a powerful CR950 engine. This is a reliable 208cc OHV engine that delivers an impressive gross torque. Want to know the best part of having high gross torque engine? A high torque pressure washer machine means the pump can turn or produce a rotating force at any given moment. This means the pressure washer unit can clean even the toughest terrains. So, you can walk confidently while cleaning any surface thoroughly as well. Its triplex pump also has an adjustable pressure regulator. Therefore, you can control the water pressure coming out of the unit to match whatever task is at hand. Just like any heavy duty cold water pressure washers, this unit makes use of an EASYflex hose, which is suitable for heavy-duty outdoor cleaning tasks. The hose measures 30-ft long. It also comes with 5 quick-connect nozzles and a detergent siphon hose, which ensures that the hose can withstand whatever detergent you use for washing. Verified and certified by PWMA, you’ll have a peace of mind knowing the pressure washer machine is tested by a reliable testing program. There is no pressure washer surface cleaner attachment included in the package. This is not a key start pressure washer. It’s a pull start unit, which makes it a bit difficult for first-time users. If there is one pressure washer brand that has always been on my top heavy duty pressure washer list, then it would be Simpson Cleaning. Simpson Cleaning PS3228-S GX200 is a heavy-duty cold water pressure washer for sale in almost all online retail stores. The product's popularity is due to its efficiency, versatility, and durability. You can use this unit to clean almost all cleaning tasks at home, such as sidings, driveways, fences, gardens, even paints, outdoor furniture, and RVs and ATVs. 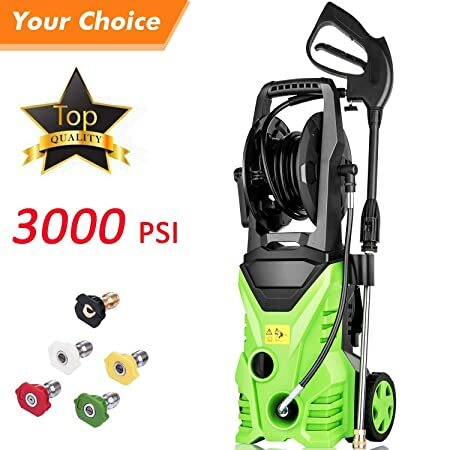 When buying a Simpson Cleaning PS3228-S GX200 3300 PSI pressure washer, you’ll get to enjoy 3 things: (1) AAA industrial triplex plunger pump with PowerBoost technology, (2) Abrasion and kink-resistant heavy-duty hose, and (3) professional spray gun with a safety lock. This unit is powered by the Honda engine, which is known for its power and efficiency. Its GX200 OHV engine is a commercial type engine that can blast away grime, dirt, and stain with minimal effort. Because safety should always come first, Simpson makes sure to include a safety lock in its spray gun. A lot of its users also commend how the unit is well-built and has heavy gauge frame components. This makes this unit the best heavy duty pressure washer for outdoor use. Simpson Cleaning PS3228-S GX200 3300 PSI Pressure Washer has the best warranty service. It offers a 3-year limited warranty for the engine, 5-year limited warranty for the pump, and another 10-year limited warranty for commercial use. There is also 5 quick-connect nozzle tips that you can choose from to make the most out of the machine’s cleaning potential. You can’t use this one with a 5/16 hose. However, you can replace and use a ⅜” quick connect instead. The instructions may be a bit difficult to follow (unless you’re a professional or have used this unit before). Watch a YouTube tutorial or review first to make sure you are doing the right thing when starting this unit. One thing that catches my attention with this pressure washer unit is its unique design. Unlike most heavy duty electric pressure washers, this one has no welded steel frame but has all the necessary features you would need in a heavy-duty unit. This platinum edition model is an electric unit but has an impressive cleaning power of 6,600 CUs. 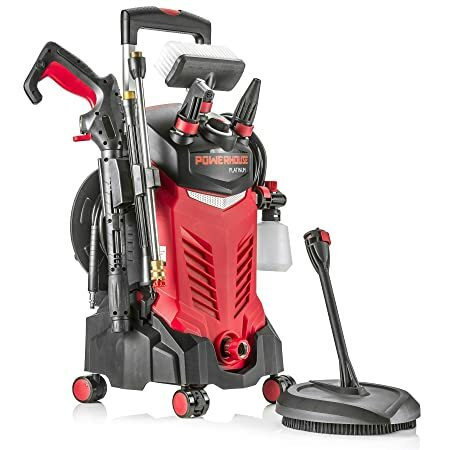 If you are looking for a 3000-PSI pressure washer unit that has a heavy duty pressure washer gun, then Powerhouse International 3000 PSI Platinum Edition is the one for you. It may be an electric pressure washer, but it has a heavy duty pressure washer pump that can give other heavy-duty gas units a run for their money. Its pump runs smoothly and quietly while doing an efficient job. With 5 quick-connect spray tips, you can choose the right nozzle to use for a particular task. The 5 nozzle tips are 0-degree, 15-degree, 25-degree, 40-degree, and a nozzle for watering. To make it even worth buying, 2 propriety nozzles are also included in the package. There’s the turbo nozzle and the angle nozzle. So, you pretty much everything you would need to complete your cleaning in no time and with less effort. This heavy duty electric pressure washer 3000 PSI has a stable design despite the absence of the steel frame. Instead, it has 4 casters so that it is easier to roll with you when cleaning. Many also consider this the best heavy duty electric pressure washer for cleaning house sidings and fences. This unit is not cheap. Although it has 2 steel lances, don’t expect this pressure washer to reach roofs and high walls. Flagup is the newest addition to my list of brands to watch out for this 2019. And it seems that I’m not the only one since other online reviews have included the Flagup 3000 PSI model on their list too. It’s an electric pressure washer which can be used both indoors and outdoors. It’s a semi-professional unit suitable for some commercial uses, such as car washing and small rental business. In terms of cleaning capacity, this Flagup unit has a 3000-PSI level and 1.8 GPM, amounting to 5,400 CUs. It’s an affordable pressure washer. Produces high pressure that can tackle heavy-duty cleaning around the house. You also get to enjoy its TSS or Total Stop System, which automatically shuts off the pump when the machine is not in use. But what makes Flagup 3000 PSI pressure washer a unit worth investing? Well, I particularly love its air-cooled industrial motor. This means that the engine won’t overheat and that it is safe to use even when used for a long period of time. The most well-rounded pressure washer on the list; this is ideal for cleaning all types of vehicles including ATVs, RVs, Boats, and SUVs. Its flow rate is only 1.8 GPM. Most heavy-duty pressure washers have 2.2 or 25 GPM. Still, you can complete a lot of tasks with this unit. There is no space for the nozzle tips storage. So, you can’t keep the nozzle on the pressure washer. It’s a bit hard to only choose one favorite heavy duty pressure washer from the list. But based on experience and personal research, the higher the PSI and GPM levels are, the more powerful the unit is. 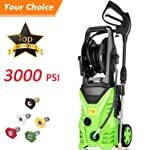 So, if I were to choose the best heavy duty pressure washer for sale right now, then I’d say the PowerBoss 3300 Max PSI Gas Pressure Washer gives the best return on investment so far. It has an impressive cleaning power and is suitable for both medium and heavy-duty cleaning jobs. You can also do a lot of cleaning operations with this unit. This is ideal for cleaning the patios, doing a car wash, and even cleaning sports and factory equipment. A well-rounded pressure washer machine indeed! 1. Pressurewashr.com for the details about heavy-duty pressure washers. 2. Powerboss.com to get the accurate information of the PowerBoss 3300 Max PSI pressure washer. 3. Briggsandstratton.com for the exact details and specifications of the Briggs & Stratton Elite 3300 PSI model. 4. Pressure Washer Reviews from PressureWashergGuides.com since their homepage provides enough information and data.